I'm not ashamed to admit it. This blog was my binder, pretty much. Plus a folder on my desktop where I saved pdf receipts. 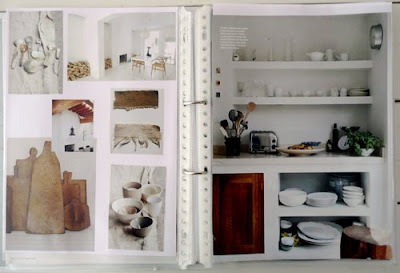 But this post from Lovely Morning (via the style files) has galvanized me to start a home inspiration binder. And I'm gonna stick recipes in there right along with the design photos. Those clear inserts are genius. I <3 Polypropylene. Does that make me a bad, un-green person? Love it. I actually didn't have a binder for a while (I have a blog! I thought to myself). But then I realized 1) I really like binders o' inspiration 2) I can't take the blog with me when I meet with people 3) I post lots of stuff on the blog that is about other people's weddings, not ours. Sooo... a binder has emerged. It's filled with a lot of photos printed off the blog, but it's helpful (and mostly just fun). I have a home inspiration binder too. Also fun! I don't have a binder. I'm very low maintanence and the wedding is very simple. But, I do have a large envelope where I have collected a few images and info pertaining to my responsibilities for the wedding. The fiance has his share of of stuff too. "visuals" this is more fun than files on a computer.....Really good for jump-starting a project when you have time to sit down and work. My laptop is my binder. I have ripped a total of about 5 pages out of magazines so far... everything else has come from inspiration online or out of my head. Homes magazines are much more interesting than wedding one, though, so I can totally understand the transition. I might have to get one too once we move on from project wedding to project own home. i totally have a home inspiration binder that i started a few years ago! though lately i've been putting photos directly onto my blog. Is it bad that I already have a recipe AND home style binder??? The recipe one is great - actually its a paper filled notebook that I can either write on, OR print out recipes and tape them to. The home one is just because that's the profession I'm in, have been obsessed with pretty much my life,and have been looking through those mags for so long. My piles were getting too huge, so I went through and tore out the good stuff to keep. It's amazing how your style can change!